In addition to ending with one of the likely games of the tournament in Portugal – Spain, Friday offered an excellent start to the real World Cup following Thursday’s low rent opener. The first game of the day finished up Group A, with group favorites Uruguay facing Egypt. The central question of the game was whether or not Egypt and Liverpool’s Mohamed Salah would start following his shoulder injury from a brutal (and quite possibly malicious) foul by Sergio Ramos in the Champions League final. Salah was available and warmed up, but did not enter the game. Amr Wadr replaced him on the right of an expected 4-2-3-1, with Al Ahly keeper Mohamed El Shenawy a surprise replacement for 45 year-old Essam El Hadary. Uruguay set up in an expected 4-4-2, but with 19 year-old Federico Valverde on the bench, Rodrigo Bentancur moving inside and Giorgian De Arrascaeta at left wing. Edinson Cavani tended to drop underneath Luis Suárez, but without the defensive responsibilities one would normally associate with that role in a 4-4-1-1. 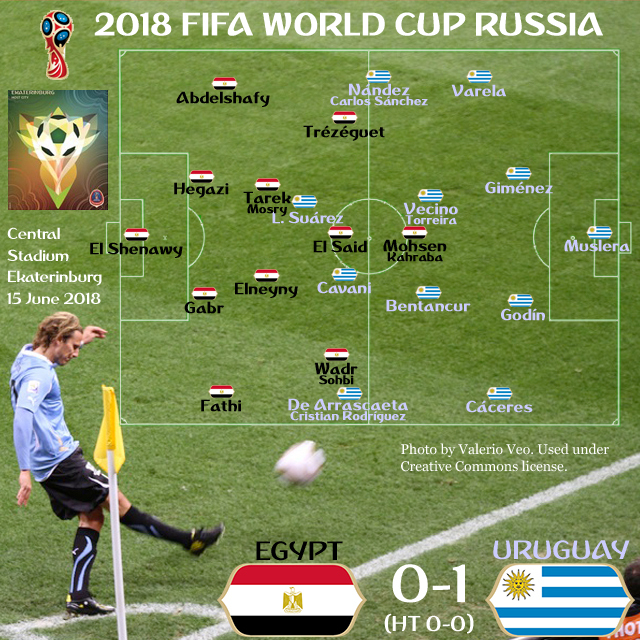 Though clearly the better team, Uruguay struggled to break down a well-organized Egyptian side. Even so, Luis Suárez had a number of critical chances, often fed by an industrious Cavani. But Suárez simply missed his first big chance, and after that El Shenawy proved the star of the game, stopping the chances that slipped through. Oscar Tabarez’s substitutions of Cristian Rodríguez and Carlos Sánchez largely confirmed that his initial decision to go with youth was the correct one. But an 88′ header by José Giménez gave Uruguay a deserved but heart-breaking goal to ruin Salah’s 26th birthday as he watched helpless from the sidelines, Hector Kuper having made his final substitution a few minutes earlier. It is hard to imagine either Russia or Saudi Arabia beating either of these sides, though it is possible that Egpyt might struggle to score against Russia if Salah does not play. 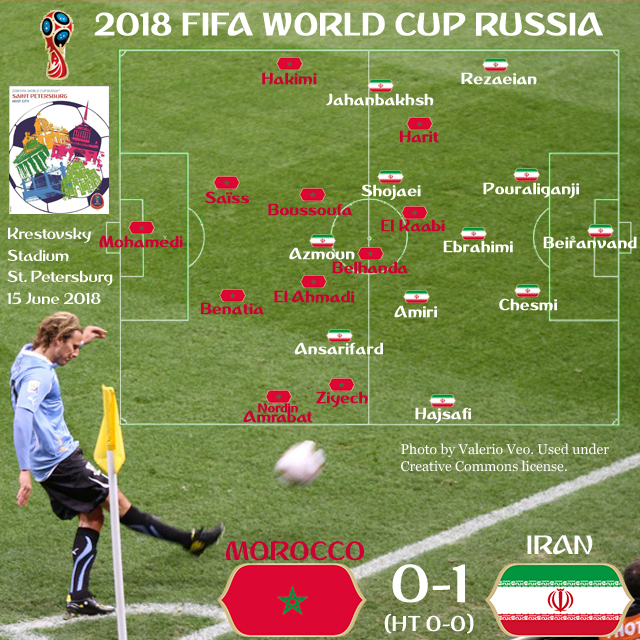 The middle game of the day saw Morroco take on Iran, the most physically attractive team at the World Cup (based on extensive Panini sticker research and confirmed by eyewitnesses on the day; your results may vary). Morocco played an expected 4-2-3-1, but with Nordin Amrabat at right back rather than at right wing, Hakim Ziyech moving to the right so that Amine Harit could come in on the left, and Ayoub El Kaabi replacing Aziz Bouhhadouz up top. Iran’s 4-3-3 also contained changes, with Karim Ansarifard replacing Mehdi Taremi at left wing and several other surprises in a midfield and defense not clearly settled prior to the tournament. Morocco were the better side in what was a must-win game for either of these teams to have a realistic chance of qualifying. They dominated possession, and while Iran were able to create chances on the counter, they looked decidedly second-best. Football, however, is a funny game. A late own goal off a corner kick gave Iran an unexpected victory, and may have eased Portuguese and Spanish fears about tying against a difficult Morrocan, contributing to the attractive football played in the final game of the day. With Uruguay and Iran adding to the two late goals by Russia and Cristiano Ronaldo’s late free kick, 5 of the tournaments first 13 goals have come after the 88th minute. It’s a trend we can only hope will continue.